Start this Slow Cooker Chicken with Sweet Potatoes in the afternoon and have it for dinner that night! Use the Recipe-by-Photo Index Page for Chicken to see all the slow cooker chicken recipes that have been featured on this site. In this dish of Slow Cooker Chicken with Sweet Potatoes from Chick in the kitchen, chunks of sweet potatoes, onion, garlic, and Baby Bella mushrooms are put in the CrockPot, with chicken breast pieces layered over the vegetables. Then a mixture of vegetable stock and white wine is poured over with dried thyme sprinkled on top. Dara followed recommendations from her friend Jen to make this a hit, and next time she would serve over rice to catch the flavorful liquid. 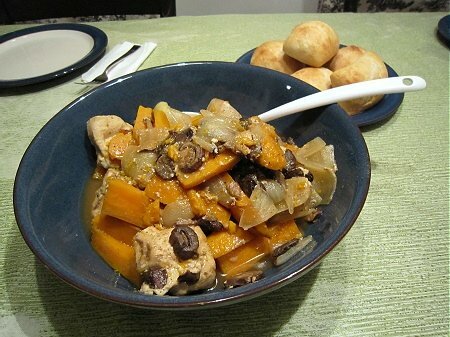 Get the complete recipe for Slow Cooker Chicken with Sweet Potatoes from Chick in the kitchen. Use the Recipe-by-Photo Index Page for Chicken to see all the slow cooker chicken recipes that have been featured on this site. The slow cooker is my next project… this would be perfect for my beans stew which I like to cook a lot. Gay I would love some beans added to this recipe! Hope you have fun with the new slow cooker.